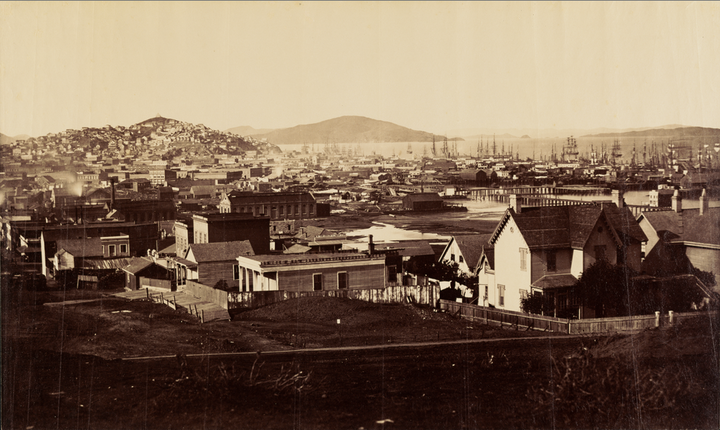 View north from Rincon Hill across the urbanizing Yerba Buena Cove, mostly filled but still some areas of water visible in this 1860 image. 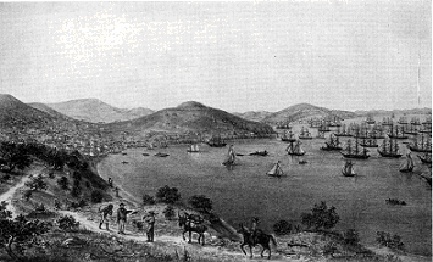 The village of Yerba Buena in 1846, three years before the Gold Rush and the name change to San Francisco. Montgomery St. between Clay & Washington is the shoreline. 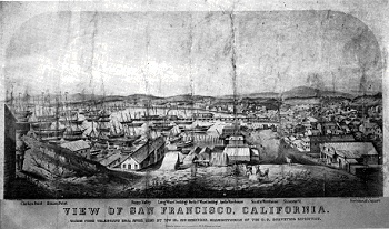 W. Davis, an East Coast captain, describes Yerba Buena Cove in 1833: "We anchored in a cove known as Yerba Buena. Telegraph Hill was then called Loma Alto. At that time there were some half dozen barks from Atlantic ports trading along the California coast, Alaska and the Hawaiian Islands. All that time, Captain Mariano G. Vallejo, later General Vallejo, was in command of the Presidio. The population of the post was about two hundred and fifty men, women and children. The soldiers were Spanish, and all vaqueros. At that time Captain Vallejo had recently married Donna Francisca Benicia Carrillo. Fort Point was then garrisoned and known as Punta de Castillo, or Castle Point. 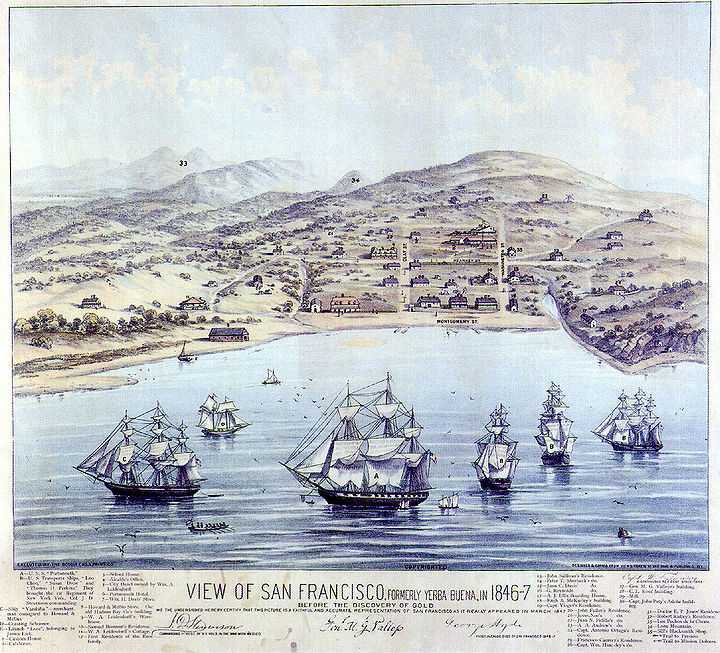 A small number of foreigners were living near the post, among them [[WILLIAM_RICHARDSON_AND_YERBA_BUENA_ORIGINS|Captain William A. Richardson], who owned the Sausalito ranch, and who was married to the daughter of the late Captain Ygnacio Martinez, who had been in charge of the Presidio post preceding Captain Vallejo, John Read of Ireland, owner of the Read ranch adjoining the Sausalito ranch, Tim Murphy and James Black, the latter of Scotland." Until 1847, San Francisco was known as Yerba Buena, after the fragrant plant that was so abundant here. Still found on the Presidio and elsewhere in the city, yerba buena ("good herb") has been used medicinally for centuries by Ohlone Indians. 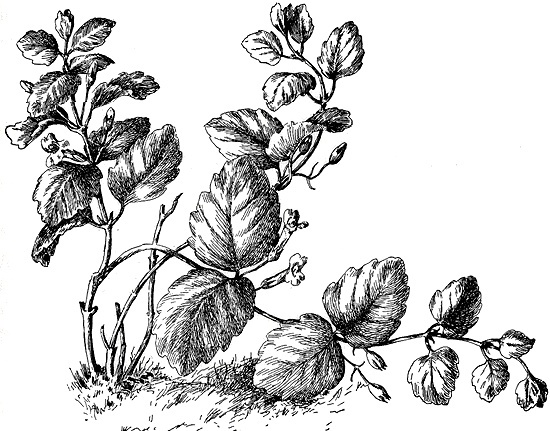 "Yerba Buena" is a local herb similar to spearmint.